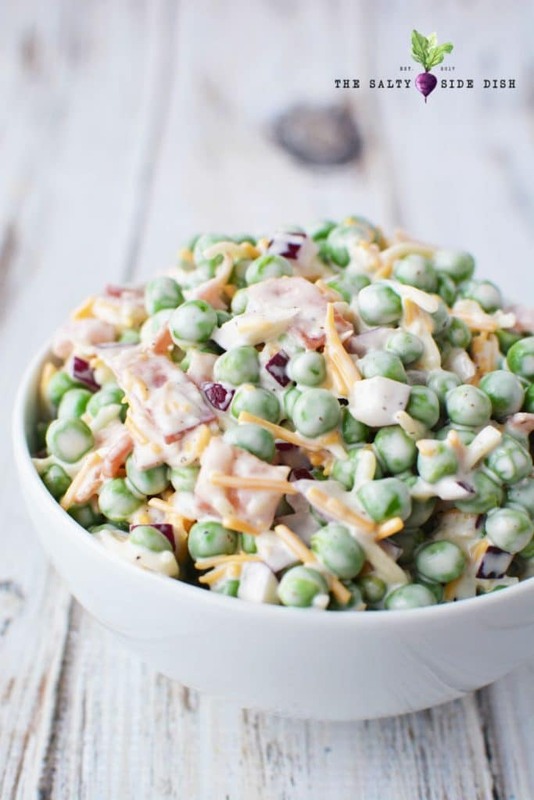 Pea Salad is a quintessential recipe for spring and summer with its creamy texture and taste. And talk about an easy recipe! If you can mix, you can make, which means this pea salad is done in mere minutes to free you up for summer fun. Not that you would know it by the temperature outside in most of America, but summer IS on its way. That means tons of time at the beach, parks, picnics – which also means plenty of hungry friends and family! You can always go with old food staples like cucumber feta tomato salad (which is so fresh and light) or favorites like caprese salad with cherry tomatoes and mozzarella, but everyone loves a gorgeous green pea salad. Personally I just adore the texture of peas and they are super underrated, which means little chance for someone to bring the same thing. And making changes to the ingredients is typically not an issue! 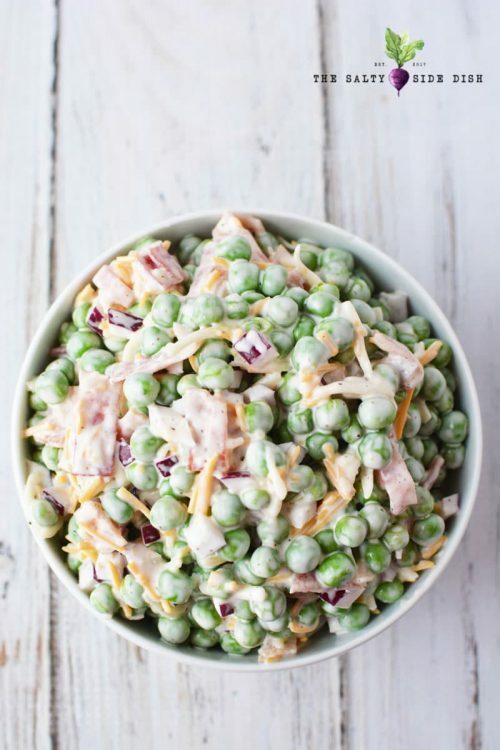 Try adding more bacon, cut up tomatoes, or even make your pea salad with egg! Separately these ingredients are delicious but together they make a perfect side dish that will compliment all your upcoming meals! This cold dish is fantastic to be served with fried chicken, BBQ, grilled meats or even just have in a bowl as a main dish (which is what I do). Make it Vegetarian: Just remove the bacon! This dish is so creamy that it’s a perfect summer salad combination with bacon, red onions, and cheese that will have your guests begging for more. Always on the table in the south, this recipe is the one you grew up with; flavorful and easy to indulge. Plus you won’t believe how easy it is to make! With no baking or cooking needed, your salad can be ready to walk out the door quite quickly. 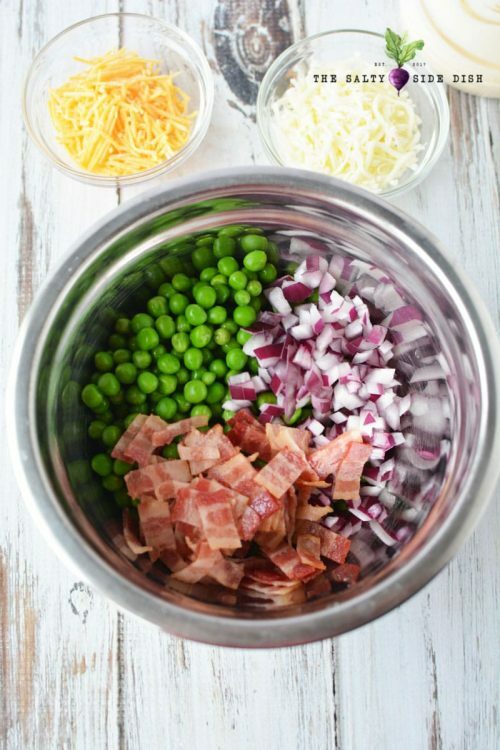 In a large mixing bowl combine thawed peas, bacon, onions, both kinds of shredded cheese, mayonnaise and mix well so that all your ingredients are covered. Season with salt and black pepper and mix a few more times, adding a dash here or there to make sure you get full coverage of your spices. Refrigerate 4 hours or overnight to make sure flavors and creamy dressing blend and are cold upon serving. Mix well one more time before dishing out. Looking for a complimentary fruit salad to take with you? Try Old Fashioned Ambrosia Salad – just like grandma used to make! Or if you need your salad a little more savory, I love this Amish Macaroni Salad. 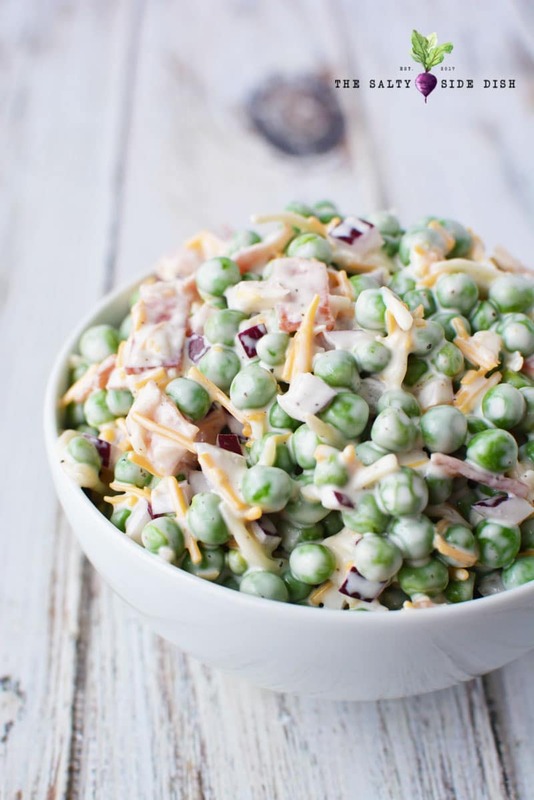 Pea Salad is a quintessential recipe for spring and summer and so easy. 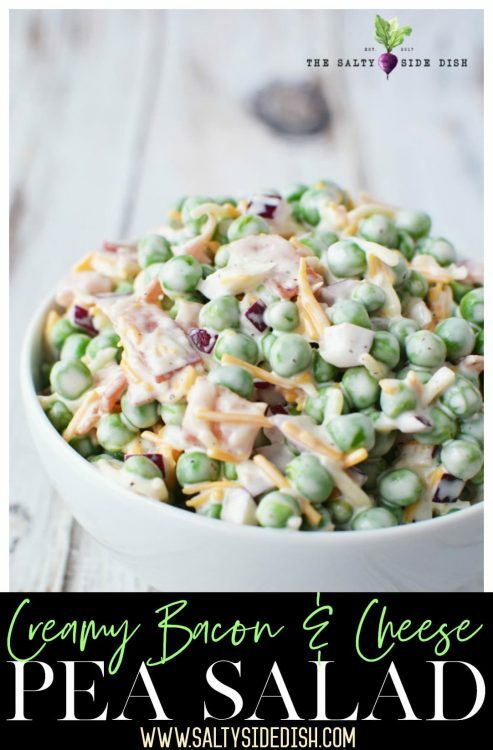 Peas, Cheese, and slices of bacon make this a flawless cold salad side dish for outdoor summer servings. 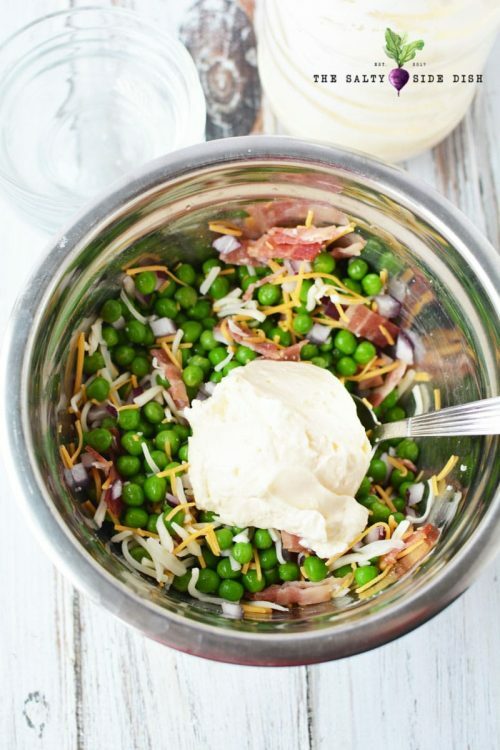 In a large mixing bowl combine peas, bacon, onions, cheese, and mayonnaise and mix well. Refrigerate 4 hours or overnight. Mix well before serving. Chill for atleast 4 hours and keep cold prior to serving. Did you make my pea salad recipe? I made the salad with a few changes. I added 1/4 cup sour cream with the mayonnaise and some dried dill. I love this salad. It’s perfect to go with grilled burgers, sliders and deli style sandwiches. I love your alterations! Thanks for chiming in, Ill try it your way too next time we make it. I made this super simple salad today during my keto weekly meal prep. I omitted salt and pepper (because I have kids and THEIR salt and pepper tastes vary daily, so We add such things individually.) I added the spice called “Sunny Paris” by Penzeys. It has a great blend of purple shallots. CHIves, green peppercorn, french basil, french tarragon, chervil,bay leaf and dill Weed. The addition was very tasty. (I’m not affiliated with Penzeys, just a satisfied customer! )I’ll be checking out more of your recipes and I know I’ll make this salad again and again. I have never tried Penzeys! I will check it out. Also just so you know, most people on Keto do not eat peas. They are certainly delicious but I believe have too many carbs for a traditional Keto program. I dont always provide it as most nutritional guides on recipes are pulled in and automatically calculated and sometimes are not correct. You can drop this recipe link into CarbManager and adjust your personal serving and it will give you an estimate. 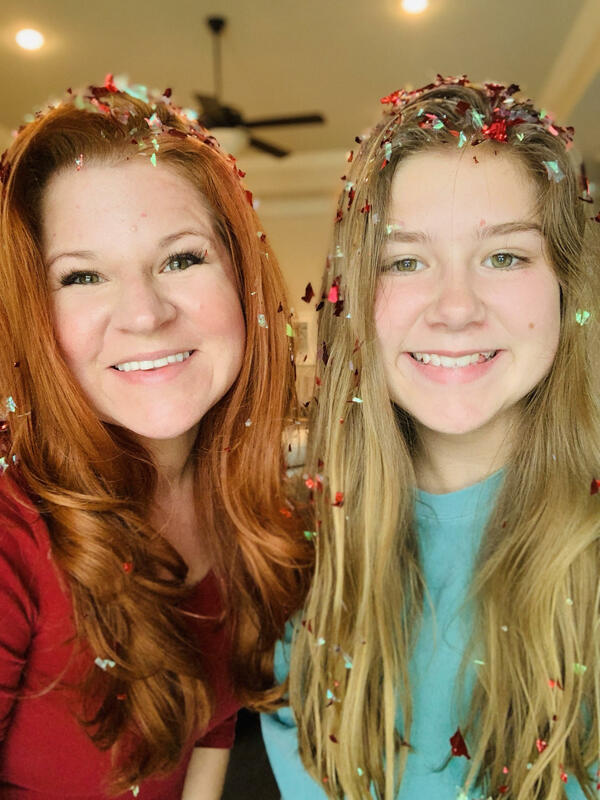 I am currently looking for a way to provide solid information to readers that can be trusted. I love pea salad, I always made it with just Hellman’s, but then I discovered Marzettis sweet Vidalia onion salad dressing! Oh wow! I use half mayo and half dressing now and it’s soooo good! This salad is great made with homemade ranch dressing instead of mayo, and yes – fill weed! Sometimes I add very small pieces of raw cauliflower! But the peas and red onion – yum!! Lots of red onion! OOH Yes! 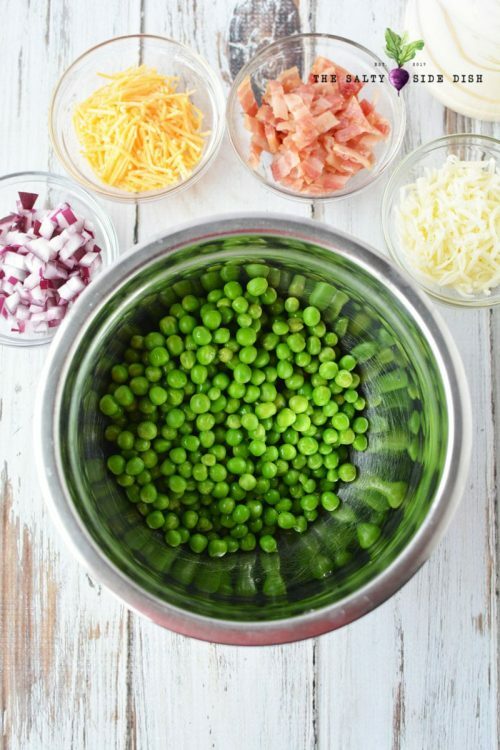 Fantastic idea for this pea salad!